This information will be used by District Admins who want to know about the Toolbox for District Admin. This toolbox has some items not available to other account types. District Admin accounts have rights to manage user accounts like administrators for school sites and they can link to any school site in the district and have full admin rights for those sites. Note: District accounts do not have access to LoopMail. Roles available for the district site are limited compared to school sites. If directory services are in use, there will be an additional menu choice to activate user accounts. School Site List: Provides access to all other school sites, and Global Settings for editing terms, marking periods, and school settings. Request School Site: A form for submitting requests for new school sites in an account's district. Request Status: Check on the status of school site requests. 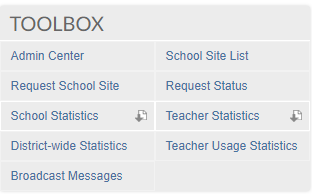 School Statistics: Download a text file that contains the usage statistics for all schools in the district. Teacher Statistics: Download a text file that contains the usage statistics for all teachers in the district. Teacher Usage Statistics: Online display of teacher gradebook statistics (Plus). District-wide Statistics: Usage for schools and the district as a whole. More information can be found on the District Stats Help page. Broadcast Messages: Blast email messages to all registered users. There is one additional link in each school's toolbox for District Admin that is not available to local System Admin accounts. Download Gradebooks List generates a .csv file containing a list of every gradebook for every teacher and includes the teacher name, course, course ID, gradebook name, start date, end date, and gradebook version.